It’s Follow-Up Friday: Pixel Puzzle edition! And today, I’d like to return to the subject of puzzle art! I stumbled across this terrific art print from 30 Squared a while back, and I thought it would make a fun puzzly challenge for the PuzzleNation readership. We’ve got twelve famous vehicles from movies and television, presented in pixelated form. 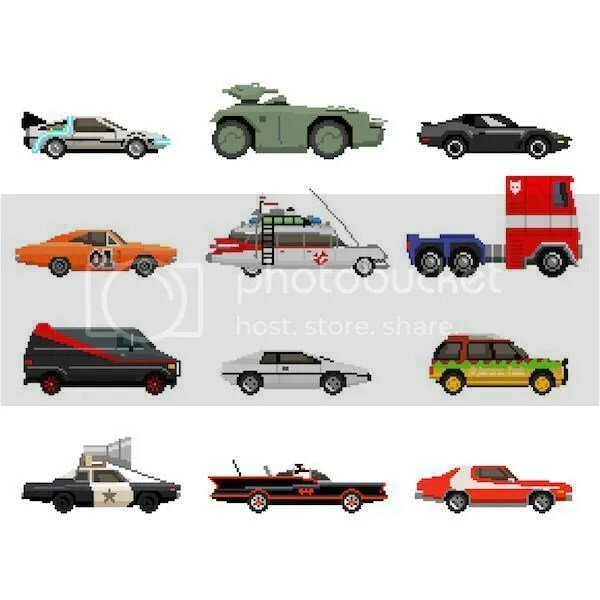 Can you identify the TV shows or movies that featured these iconic vehicles? Let’s put your pop culture knowledge to the test! This entry was posted in PuzzleNation, Puzzles and tagged 30 Squared, Auto All-Stars, DIY puzzling, Follow-Up Friday, games, Geeking Out, pixelated art, pixelation, pixels, Pop culture, Puzzle art, Puzzle to solve, PuzzleNation, Puzzlin' fool by gmdirect. Bookmark the permalink.